Daisy has never left her home in Brightwood Hall. She lives a comfortable life with her mother, surrounded by the history of her family. Until her mother disappears, and a man appears at the house. The fact that Daisy has never left Brightwood Hall already hints that something odd is going on. That something is her mother experiencing a trauma as a child. She hoards supplies and other items, to the point of filling up the rooms in the manor house with storage shelves. She only leaves to get supplies, and doesn’t want Daisy going out at all. That fear of losing things has been enabled by the family’s wealth. She’s never really had to face her trauma, because it’s very easy to shut the world out living in a manor house. It’s easy to hoard when you have so much space. I liked that the story did address these things. 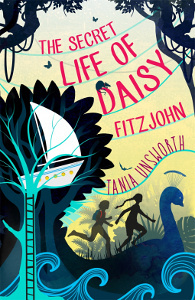 Daisy comes to realise how much her mum’s life has been influenced by those past events. And how this has trickled down to Daisy’s life. Daisy is a fun protagonist. She holds conversations with the animals and artwork. This includes statues, topiary bushes and portraits of her ancestors. Whether this is entirely imaginary is up for debate. They certainly help her come to a decision about what to do when the man arrives. I enjoyed the writing style and pacing of the book. There are elements of mystery, about who the man is and why he’s there. There’s some action, as Daisy acts out her plans. I wish I could end the review there, because there are a lot of things about the book I really like. I was promised an adventure set in a manor house, and it delivered on that. The problem was The Crazy. Daisy has been told that The Crazy runs in the family. It means a person is vile and has most likely murdered people. This made me wince the first time it was introduced, but I gave some benefit of the doubt that it would be addressed later. It wasn’t. The best Daisy gets to is maybe people would call her mum crazy, but she’s not properly crazy as she’s not violent. Daisy doesn’t realise, at any level, that The Crazy is upper class entitlement, rather than a health condition. If you feel you’re better than anyone else and entitled to things, you’re not going to care who you hurt to get it… those other people aren’t really people, after all. This is an entirely sane, if unpleasant, response to privilege. What really struck me is it was a small part of the story, which could have been changed in ten minutes of editing. A few reworded sentences and a new name for The Crazy would have made all the difference. All it would have taken was considering how it might impact a non-neurotypical reader. The result was though I generally enjoyed the book, I was cringing at those moments when The Crazy came up. They pulled me out of the story. Crazy often looks more like Daisy’s mum. Crazy often looks more like me. It doesn’t make someone a murderer.